Small and lightweight, the entry-level QuickScan QD2100 linear imaging scanner is ideal for government, retail and office environments. The QuickScan QD2100 is economical and easy to use. 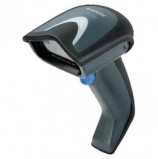 It offers snappy reading performance on hard-to-read barcodes, a visual indicator (green spot) that gives instant user feedback indicating the barcode was read properly, a user-replaceable scan window, and USB, RS-232 and other interfaces. Small and lightweight, the entry-level QuickScan QD2300 laser barcode scanner offers the ability to read long barcodes from a short distance, making it ideal for government, retail and office environments. The QuickScan offers snappy reading performance on hard-to-read barcodes, wide scanning angles for reading longer barcodes and USB, RS-232 and other interfaces.